BARRY’S BAY – Striving for excellence is a priority at The Valley Gazette. 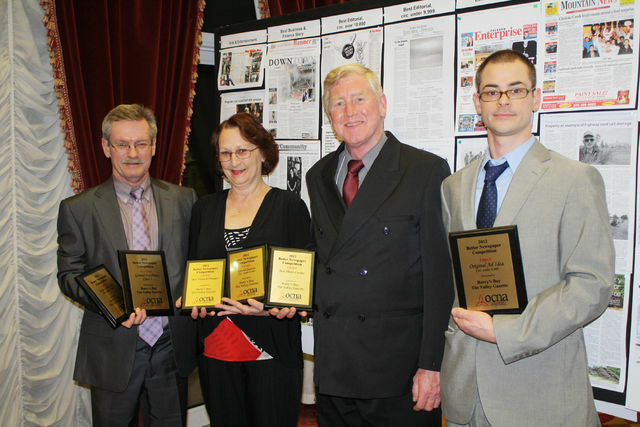 Alongside the Gazette’s desire to produce a quality paper, commitment to community coverage and involvement is a primary concern, and because of this commitment, the Gazette has brought home six awards for the newspaper’s 2012 coverage. On March 22 staff made the trip to the Hilton Garden Inn in Vaughn for the 2012 Better Newspapers Competition Award Results (BCNA) Gala. 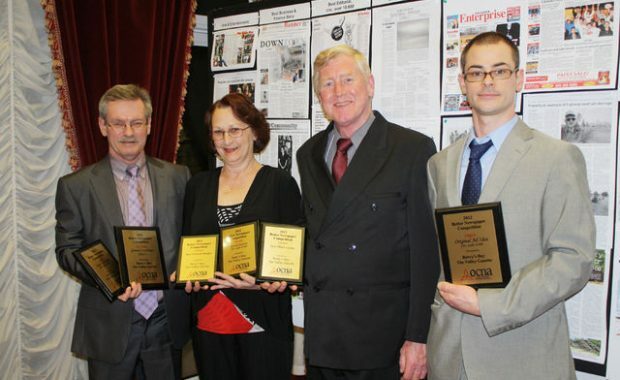 The awards are hosted each year by the Ontario Community Newspaper Association (OCNA) and this year they had over 2,014 entries from its members. Production Manager, Greg Zawidzki led the way for the Gazette this year, taking home first place in the Premier Award Advertising Division for Best Original Ad Idea. Zawidzki had a beautiful vision, judges said. The Gazette also brought home awards for General Excellence, Best Vertical Product and Best Photo Layout. For General Excellence in the 1,999 and under circulation category, The Valley Gazette took second place with a lot of praise for their Remembrance Day Edition. Judges described the paper’s front-page cover, as a colourful, eye-catching collage, and applauded the Gazette staff for holding nothing back when it came to the design. For the Best Vertical Product Award and Best Photo Layout, the Gazette placed third overall, beating out numerous entries. The Gazette’s 2012 Christmas Edition didn’t go unnoticed either. For its strong presentation and layout, the edition took third place in the Special Section Category. Judges added the story of a family overcoming tragedy was an emotional and excellent read. For the Online Surfer’s Selection, the Gazette would also take home another third place award. The Gazette may have started out as the new kid on the block not even three years ago but staff have never lost their focus in regards to providing our community with only the best, Publisher, Michel Lavigne said. Daily they dedicate themselves to excellence, yet it’s gratifying to have their work recognised, Lavigne added. “These awards reiterate the commitment Michel and myself have made to support our local communities, and we will continue with this promise of commitment in years to come,” Zawidzki said. Story continue in the March 27, 2013 issue of The Valley Gazette.